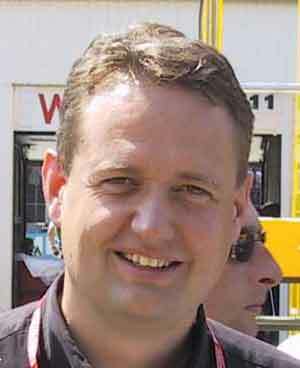 Steve Nielsen has worked his way up through the ranks in F1, having started his motor racing career as a van driver with the MSL catering crew - co-founded by John Bracey - which feeds the teams. With an English mother and a Norwegian father, one might suppose that Steve had an international childhood but, in fact, he grew up in the quiet and pleasant surroundings of the Cotswold hills in England. Looking for a little adventure after he left school, Steve signed up to be a policeman - his sister was already in the police force. He attended a police training school at Wanstead in Essex but found himself rather disillusioned by what he learned. He finished the training and then quit, deciding that travel would be more fun. He started looking for a job which would give him the chance to see the world. He had a friend who was into motor racing and, by chance, Steve read one of the magazines which was lying around. He saw an advertisement from MSL and found himself working in the motor racing catering trade! Initially he was attached to MSL's Rothmans unit which traveled from event to event, catering for Rothmans-sponsored teams and their guests. This included rallying, motorcycling racing and sportscars. The crew would spend six week at a time traveling around Europe. In 1986 he joined the MSL F1 crew as a truck driver. He quickly got to know a lot of the people in F1 and at the end of 1986 was offered a job as a truck driver with the Lotus test team. In 1988 he joined the race team. A year later he became the spares coordinator, a job he did for two seasons. In 1991, however, Lotus was in decline. Rupert Manwaring - who had hired Steve at Lotus - had moved to Tyrrell and he asked Steve to move to Ockham with him. Steve agreed and he stayed at Tyrrell as spares coordinator and later as head of the truck department as well. In the middle of 1994 he was made assistant team manager to Manwaring. Less than a year later he received an offer to join Benetton as assistant team manager to Joan Villadelprat. In fact he remained in the job for just two months before Tyrrell rang him up and offered the job of team manager. It was an offer he could not refuse and off he went back to Ockham again. He remained with the team until it closed at the end of 1998 and then joined Honda Racing Developments as team manager. When that operation was suspended after the death of Harvey Postlethwaite, Nielsen had to think again and joined Arrows at the end of 1999 to be team manager. A year later, however, he received an offer to become sporting manager at Benetton and he stayed on when the team was taken overRenault.He has led the race team ever since.